Friendly and comfortable in a quiet part of Paphos, cosy relaxing atmosphire in an attractive setting. Hotel is old and tired, a shame really as it doesn't to appear to have been maintained or looked after! Old worn carpet, torn mattresses. Holes in sheets and pillow cases, cockroaches in bathroom, not just one but loads! Nice man on night shift front desk came and removed them two nights in a row, thankful for this! After calling on the beach they spoke to management and we were moved to another room on the top floor. Although management was adamant no one else has seen any cockroaches, untrue!!! Top tip.... Don't stay there or buy your own pesticide spray!!!! Because of this and stories from other guests we did not eat there even though we paid for B&B. Hotel tip: Top floor rooms Take own pesticide Eat out, first and last pub best breakfast ever! I booked this as a last minute deal and as such, it was value for money. Accommodation was very basic, but clean enough and rooms were serviced regularly, but the boiler broke down mid-week so there was no hot water for 3 days. The self-catering equipment in my studio was basic, to say the least, but fortunately I did not need to use it, apart from boiling water for a wash! Food was a big let down, I'm afraid. I only bothered with "breakfast" once during my stay and the evening meals were very expensive for what they were and very poor, especially when there are so many excellent eateries on the doorstep. The soup was especially bad and jelly and ice cream is not my idea of dessert! The location was ideal for me - midway between the old town and the beach. It was also far enough away from the noisy town centre to have peace and quiet. Road noise from the adjacent dual carriageway was not a problem. The best thing about this hotel was the hotel's staff (not the owners), who did their best to make everything as good as possible. I also met some very nice fellow guests, some of whom are hotel regulars, especially during the winter. There were two types of in-house entertainment in the bar. Football was on nearly every day I was there and as soon as the football ended, the karaoke machine was fired up. Not my cup of tea, but then I don't go on holiday to sit in a bar. I am definitely going back to Pathos, but am afraid the Paphiessa did not come up to scratch so I'll be staying elsewhere in the future. well situated just a short walk from main town.staff very helpfull escpecially the bar staff who were excellent.hotel rooms very clean, nice pool area with indoor pool just across the road next to a shop very handy! Please stay away if you don't want to ruin your break. The rooms are so grotty and dated that it is wholly depressing, and we had back ache all week from the beds. The communal area is just as ugly, and the bar full of rude, drunkard ex-pats who don't even stay there. I had no hot water for two days, and when I politely addressed the matter, I was sworn at and accused of offending 'his people'. Unfortunately for obvious reasons we do not accept reviews from where the hotel is situated - if you are a tourist please post on your return to the UK. Stayed for 2 weeks self catering. Does what it says. A very clean and friendly hotel. Great service, Mohammed, Purna and Karen could not do enough for us. All staff were friendly and welcoming. Staff were also great with the children. We spent most of our time by the pool. There were plenty of sun beds to choose from and the children's pool was perfect as it was shaded in the afternoon. Food was good and reasonably priced. Excellent service. Good little shop on the corner opposite the hotel. Andreas Taxis on the corner were also very friendly. A smokers paradise. Dirty shabby and old fashioned would not recommend this hotel to anyone. The owners are rude and uninterested. The decor looks like it hasn't been changed since the 70's. The rooms are grubby and stink of cigarette smoke. The bathrooms dirty with cracks in sinks and bath. The food - dreadful. Poor choice, and reminiscent of British seaside hotel in the 60's. eg Tomato soup, fish and chips, ice cream and jelly. I kid you not! Breakfast - sliced bread, reheated eggs, undrinkable coffee. No Cypriot food on menu apart from Haloumi! Evenings - Appalling down - market entertainment in a smoke filled bar. Definitely the worst hotel I have ever stayed in. Dreadful value for money. There must be better than this, surely? Paphos itself, has some nice parts, but the area near hotel is tacky, all gift shops and fast food chains. Hire a car and see the real Cyprus, away from the crowds. There are some gems to be found, but you have to look for them! This was not our first choice but we were very pleased to have stayed here. Food was excellent all holiday. The staff were a credit to you. Not a football fan. Just our luck it was on most days. Would visit again under our own steam not with travel firm. Having said that the room was clean with a fridge, small 2 ring hot plate and a microwave and aircon. Our room away from main building overlooking waste ground and abandoned car. We stayed on half board - beakfast simple greek/continental style, evening meals were on the whole good, but menu lacked choice and meals were very plain, but service excellent. Hotel staff were very helpful and polite cannot fault them. 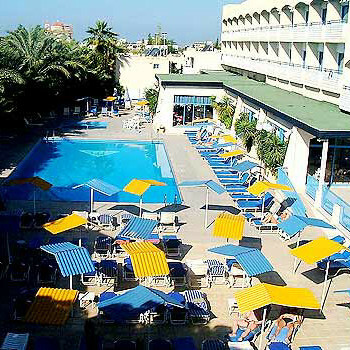 There were plenty of sunbeds by the pool and the area alway looked clean and tidy. The road noise was not too off putting. For a good beach take the No. 10 bus to Coral Bay for 80c.